There is no doubt that full-size pickup trucks are in the focus in the US, but on the other hand there are crowd of the buyers which don’t need full-size towing and hauling capabilities and also don’t want their large proportions in everyday driving. That can be reasons why they might want mid-size pickup truck versions which popularity has been growing in the last few years. Among mid-sizers in the US the Nissan Frontier has long been there as good solution with its good off-road abilities and respectable hauling capability. However, the mid-size class was in stasis for almost a decade and many models have been present with minimal upgrades over the years. The things have started to change recently when new GMC Canyon and Chevy Colorado emerged and Toyota has also refreshed its Tacoma. But Nissan Frontier has soldiered in very similar from since 2004 with some upgrades in 2011. It has been expected to be redesigned for upcoming or 2018 model year but company has been mum about it. The new NP Navara which is actually version for markets outside the US has been on sale since 2015 but US-spec Frontier hasn’t been announced for redesign yet. It seems that company has been busy with Titan model and that we will have to wait for the redesigned Frontier in 2018 model year. So, strong indications suggest that the new 2017 Nissan Frontier will continue with minor changes. While we are still waiting Nissan to clear things about new-generation Frontier, we assume that new 2017 Nissan Frontier will be powered with familiar four-cylinder and V-6 engines. There are some suggestions that new model might add a diesel engine in the lineup but we don’t expect that scenario for the upcoming model year. Suggested engine is four-cylinder Cummins diesel which actually was used in Nissan Frontier Desert Runner Concept model. This 2.8 liter diesel mill was paired with 8-speed ZF auto transmission and its output rated at 200 hp and 350 lb-ft of torque. This engine would certainly be welcomed, especially because of improved fuel economy over the current V-6 engine but this is still only a speculation. On the other hand, the base engine on the current version is a 2.5 liter four-cylinder which makes 152 hp and torque of 171 pound-feet. With this engine come five-speed manual and automatic gearbox and two-wheel drive only. Fuel economy stands at 21 mpg combined. Old but punchy the 4.0 liter V-6 engine is optional and it can produce 261 hp and 281 pound-feet of torque. It can be also had with two mentioned transmission and with either rear- or all-wheel drive. In terms of fuel economy it is less efficient than V6 engines in rival models. It returns 19 and 18 mpg combined depending on chosen transmission. With adequate equipment four-cylinder powered models allow up to 3, 500 pounds while V6 variants can tow up to 6, 500 pounds. When it comes to exterior design, the 2017 Nissan Frontier hasn’t been expected for big changes for this model year. Its design has been old but on the other hand it has enough traditional cues and modernism to be appealing for buyers even among more modern models from the Toyota, Chevy and GMC. It looks brawny and capable and Nissan’s signature V-molded grille sits up front. Swollen fenders and nice body lines also complement its look and it also feels well-proportioned. Of course more modern headlights, reshaped bumpers, new wheels will be welcomed and would improve its appearance a lot and at low cost. Interior of the Frontier is nice and simple and space is functionally arranged but it lacks more refinement compared to the other model from the same class. The seats of this model are comfortable and supportive and crew cab models offer more leg room in the rear seating row and storage area underneath. The center stack includes well-arranged controls designed for easy use and there is also center screen which allows smartphone integration. The Nissan Frontier is expected to be offered in two body styles including extended and crew cab versions. The extended cab models or also known as the King cab and will be available with a 6.1 foot cargo bed. On the other hand the crew cab versions will offer the choice between a 5-foot and 6.1-foot bed lengths. We expect that Nissan will retain the currently available trims which include S, SV, Desert Runner, Pro-4X and top SL. The S models are base work trucks with 16-inch wheels, air-conditioning, Bluetooth connectivity, six-speaker sound system and so on. On the SV versions we should expect cloth upholstery, keyless entry, Nissan’s infotainment system touchscreen, and options like sunroof, heated front seats, dual-zone automatic climate control and so on. On the Desert Runner versions the base equipment from the previous trim will be available but unique styling and interior details, off-road tires, special shock absorbers will be in equipment list as well. The Pro-4X is trim suited for off-roaders with a locking rear differential, skied plates, off-road tuned shocks, automatic headlights, etc. It can also be had with luxury package which adds leather upholstery, power adjustable and heated front seats, navigation, satellite radio, etc. Top of the line SL trim includes all from the previous except off-road equipment and adds 18-inch wheels, side steps, sun roof, etc. 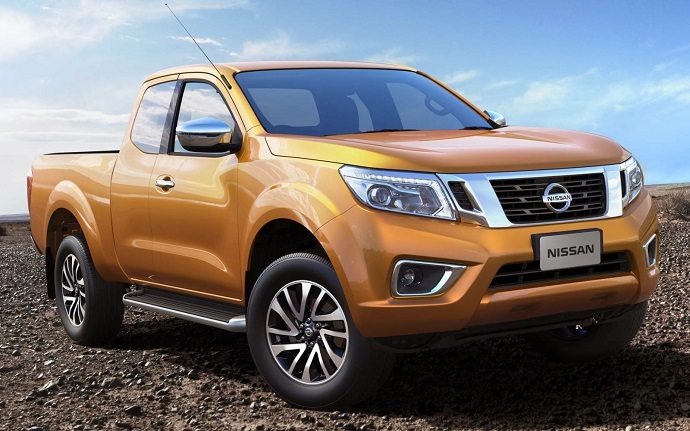 In terms of the safety, the Frontier will include anti lock disk brakes, traction and stability control, rearview camera, parking sensors, etc. It can also add emergency communication services. We are eagerly waiting official information about upcoming 2017 Nissan Frontier when we would have more precise details about it and when new-generation version will be introduced. Before then, if suggested details are true this model will be launched in the second half of this year and price should stay close to the current boundaries.